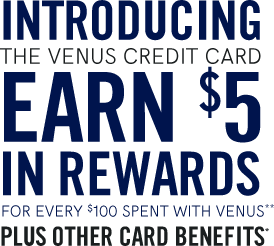 The VENUS Credit Card - Earn Rewards and Benefits Today! Do you have a pre-approval credit code? *Subject to credit approval. ** The Venus Rewards Program is provided by Venus. Venus may change the terms of the Program at any time. For full Rewards Terms and Conditions, please visit https://d.comenity.net/venus/. Venus credit card accounts are issued by Comenity Bank. *** Only for U.S. residents with a valid email address on file. Account must be in good standing. Birthday benefit will be received no later than two months after account opening for accounts opened during birthday month.